in a large mixing bowl add 1 cup softened butter, 3/4 cups confectioners sugar and vanilla. with a spoon mix until creamy. MMMM my whole family loves these. Greta photo of them, it makes me want to lick the screen! Thanx, they are as easy to make as they are tasty, only thing you have to do is double or triple your recipe as they disappear rapidly !! Looks so delicious and simple to make. Thank you for sharing the recipe. Our family has to add this to our Holiday cookie baking time together. 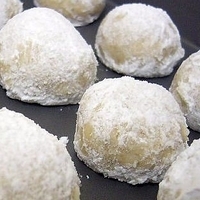 This is such an easy recipe perfect as little treats for Christmas.